Kensington, Brooklyn: Ask Kensington: What will the switch to digital mean for my TV reception? Ask Kensington: What will the switch to digital mean for my TV reception? We've all seen those ads on TV. Some of them seem honest and helpful, others seem like a scare tactic from Cablevision. The question is very real though... what will the switch to Digital TV mean for me? This may seem like it's not really a Kensington-specific question, but airwaves vary based on many things, and one of them is location. So yeah, lots of channels, and they changed around all the numbers too! Basically the channels x.1 are the regular HD channels. The x.2, x.3, etc are generally of lesser broadcast quality. But how do they look for real? In short, really, really good. 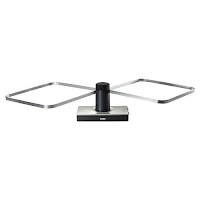 My antenna is pretty small, but aside from having to occasionally turn it 90° for certain channels or adjust to follow a drifting signal, most channels come in flawlessly. If you have a giant old antenna sitting on top of your building you should DEFINITELY use it. It absolutely should work. Don't let the guys at J&R tell you that you need something fancy. All you need is a TV, an ATSC tuner and a UHF-VHF antenna. New HDTVs include the ATSC tuner, so if you have one just plug in to the antenna and you're all set. If you need a tuner, check out the coupon program the feds are offering here: https://www.dtv2009.gov. Fill out the form and they'll mail you a $40 coupon card to use at Radio Shack or Best Buy or wherever you buy your batteries. So, Kensington, anyone else out there soaking up the digital goodness? Tell us how it's working for you or fire away with some questions below. I'm gonna go watch American Idol now.